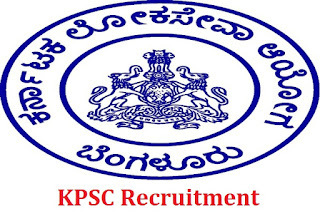 KPSC Recruitment 2017-18 Job Location: Karnataka. Minimum 18 years and Maximum 35 years. Selection of candidates will be made on the basis of Preliminary Exam, Main Exam and Personality Test. General Candidates have to pay Rs. 300 and 2A/2B/3A/3B Category Candidates have to pay Rs. 150 through e-Payment from Post Office. SC/ST candidates don’t have to pay any fee. Interested and eligible candidates may apply online through KPSC website - http://www.kpsc.kar.nic.in/ - from 27-11-2017 to 12-12-2017.